Buyers and sellers may want to tune in because changes are coming to the lending process in September and it will affect home buyers. Sellers tend to say that’s not my problem, but it will be if your buyer no longer qualifies for the loan. Certain loan programs are going to what they call Trended Credit Reports. 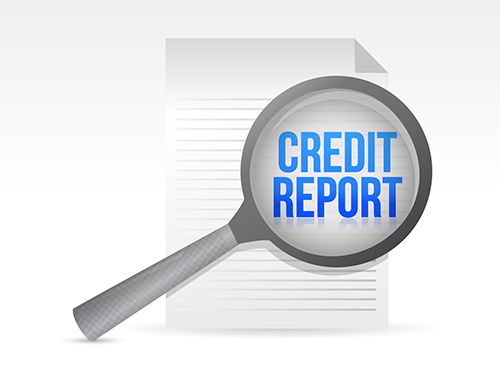 Trended credit data is different than a FICO score which captures a particular point in time. Trended data looks at the trend and whether a borrower’s creditworthiness is improving or declining over time. A buyer may have an excellent FICO score but if their trend is negative it could affect their ability to finance that much or the pricing on the loan, which also can affect the total amount financed. Many lenders are up in arms over this change, but it’s not necessarily a bad thing. For instance, let’s say you charge $1,500/mo on your credit card for everything from groceries, repairs, phone bill, etc. You pay off that $1,500/mo so you have a zero balance each month. Under the current system they see an average balance of $1,500 mo on your credit report. You choose to collect the points on your credit card instead of writing checks but the money remains the same. Under trended credit reporting it just might be that you’re not penalized for charging to your credit card instead of a bunch of online banking payments. We believe the new reporting will focus on credit utilization scores among other things and what that overall trend looks like, although we don’t know for sure. It’s important to note that this is a FNMA decision. This shouldn’t affect FHA loans. We often tell buyers, don’t go out and buy a new car just before you close on your home. Buyers get the loan approval to buy their home and think everything is a done deal. What they don’t realize is lenders go back and pull credit again just before the closing and if there is a change they can deny the loan. I’ve seen it happen more times that I care to count. I know agents out there counsel their buyers but for some reason they forget that point. If you’re considering buying it really helps to talk to a lender first. Sellers won’t entertain your offer unless a pre-approval letter accompanies your offer anyway. You can save a lot of time by knowing what the lender requires. Quite often a buyer needs to just have one thing changed in their financial situation and they’re good to go. Doing it upfront can save your deal and help you to shop in the correct price range. If you’d like to speak to a lender, give us a call. 239-489-4042 We can recommend some good ones for you and really speed up the process. It doesn’t cost any money to talk to a lender upfront, and it can save you money on inspections and appraisals by knowing the facts upfront. You’ll save time and money. Buyers are happy to find out they qualify for more now because rates have dropped. You might be surprised at what you can afford, but don’t go buy that new car until after you get the home. If you’d like to search for your perfect home, go to www.LeeCountyOnline.com It has all the homes and the database is updated every 5 minutes, so you’ll beat out other buyers to hot new listings. If you have a property to sell, you can call us too. 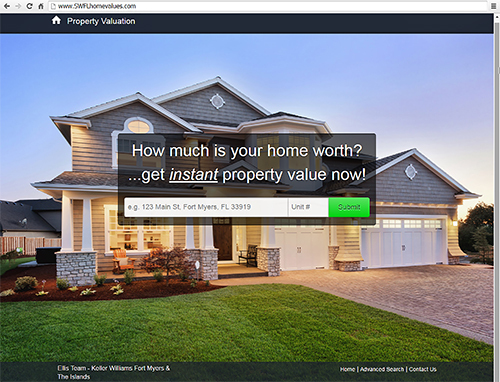 239-489-4042 Find out why our listings sell fast and for top dollar. Back in the mid 90’s we ran an ad in the News Press that said “By the Year 2010 All Real Estate Agents Will Operate the Way We Do” It was forward thinking. We were the first team in SW Florida and probably one of the first in Florida. Today we’re pleased to announce the Ellis Team shaking up real estate industry once again. We caught a lot of flack for that back in the 90’s from agents because they didn’t see or agree with that vision. Real estate had just never been done that way before. Sure there were some loose knit affiliations where agents teamed up and covered for each other, but not to the extent each person on the team had a specialized area and they owned that part of their job. Fast forward to 2016. There are many teams here locally and across the country. The benefits to consumers are many. On the listing side quite often the listing agent isn’t the best photographer. They may not be the best person answering multiple phone lines, writing ad copy, and all the various other tasks. What you want is an agent that’s great with people, marketing, and negotiating. All the other stuff can be handled by people who do that best. And yet, not all agents work as a team. That’s OK for agents doing less than 10-20 deals per year. Once you start doing some volume those tasks add up quickly. At that point if you don’t have an assistant, you are your own assistant, and you have to ask yourself if that’s the best use of your time. You wouldn’t go to a doctor that greeted you as you came in, asked for your ID card, called your insurance company, took your blood pressure, and all the stuff the receptionist and nurse does. You want a doctor who is tops and only doing what she should be doing, which is evaluating, treating, and diagnosing patients. The same is true with a good real estate agent. You want them doing tasks that will make you, the buyer or seller, money. Running a team requires managing people, setting up systems, and acquiring leads. It takes money. Converting leads is another thing, and without conversions, it all comes crashing down whether you’re a single agent or a team. Real estate has changed, and agents are learning to adapt. At the Ellis Team Keller Williams Fort Myers & the Islands we’re all about efficiency. We don’t know everything, but we have learned to listen from the best. We talk to other top teams and trainers throughout the country. We’re experts at creating leads. We have thousands. Sometimes our buyer agents get so busy working with buyers, answering internet leads, newspaper calls, sign calls, referrals, etc. We’ve been looking at ways to free them up to work with more buyers and sellers all the time. For this reason, we’re expanding our team to include 2 inside sales agents. Inside sales agents work with our buyer and sellers leads and nurture them until they’re ready to meet for an appointment. At that time a Realtor on our team meets with them and lists their home or finds them a home to buy. We love to help people and want to in the most efficient way possible. We get people the information they need when they need it. We want everyone on our team to have a wonderful life, and our customers to be better enriched by the experience. If you know someone who would make a good Inside Sales Agent, give us a call. We may have a position they never knew existed. If you’re looking to buy or sell, check out www.LeeCountyOnline.com Or you can call us at 239-489-4042 Happy House Hunting, and let’s shake things up once again! The Ellis Team Seller’s Club is a big hit, so we put our 1st episode on YouTube. The Seller’s Club is a private video e-mail each month to our sellers, potential sellers, and For Sale By Owners. It’s basically for anyone either selling or thinking of selling their real estate in SW Florida. We go in-depth with research and analysis and inform sellers everything they want to know to make informed decisions about their property. If you’d like to get on this list, simply call us at 239-489-4042 or email us. Open House Extravaganza- We do open houses differently too. This weekend we’ll have 2 builder model homes on the golf course open in River Hall. Could Brexit Benefit Southwest Florida Home Buyers? The answer is yes, it is already benefiting many borrowers. 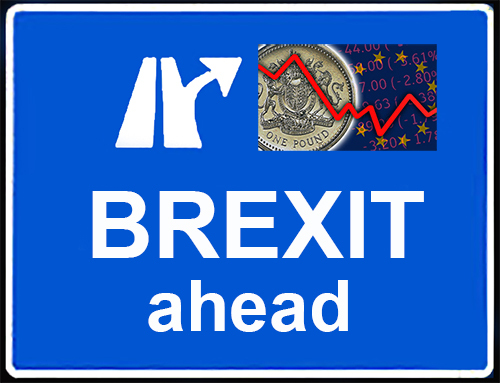 Since Brexit rates are down about 1/4% to ½%. This works out to about 6% more purchasing power for the same payment in one week’s time. In other words, a buyer has two choices. They can either step up about 6% in purchase price and not have the payment cost them any more, or they can purchase the same amount and spend less per month doing it. This helps more buyers qualify, so it can help sellers too. We have a listing in Bella Casa that has Open House Friday 5:30-7:30 and Saturday 5:30-7:30 July 8th and 9th. It is 3 bedrooms and 2 baths and is listed at $185,000. Before Brexit we needed a buyer that qualified for the full $185,000. Today we could find a buyer that qualified for a maximum $174,000 just last week and make that deal happen and it wouldn’t cost the buyer any more. In the higher price ranges it’s even more dramatic. Essentially borrowers just got either a financing discount or a purchasing boost for the same money. The buyer definitely wins, and one could argue sellers do too because now there are more available buyers for their home. When times are uncertain investors flock to tangible assets or quality. Good examples of tangible assets are gold and real estate. Both can fluctuate in value but real estate can be rented out. It’s hard to do that with gold. The EU may not be done losing participants either, and if anyone else bows out like Great Britain did it could spell more uncertainty for the markets. Gold rose and oil fell after Brexit. Gold was considered a flight to quality while oil fell because people feared a business slowdown. Sometimes the markets are fueled by consumer confidence while other times they’re fueled by opportunities. We could have fewer British and European buyers in the US market which could hurt some local markets while at the same time helping many buyers. Many times there are competing forces at work and so it is difficult for anyone to accurately predict which force wins out and who the winners and losers will actually be. Just keep in mind there are opportunities in situations like these and the news isn’t always grim. If you’re thinking about buying in this very low interest rate market we’ve got the website for you. www.LeeCountyOnline.com We think you’ll like it because it is updated with all the listings every 5 minutes. Most of the other sites take days and still don’t always get it right. Sometimes days is too long. The best properties go fast. Timing is critical. If you’d like to take advantage of this financial situation, give us a call at 239-489-4042 or register on our site. We can get you in touch with a lender who has rates below 3% as of the time we’re writing this article. If you’re a seller, we have lots of buyers and may have a buyer that’s looking for a home like yours. You can call us too. If we don’t currently have a buyer, we have marketing that attracts buyers. Give us a call and let’s see if we can get you to your next goal. Next weekend we’ll feature an Open House Extravaganza, so stay tuned. Welcome to the Ellis Team Seller’s Club. Each month we inform sellers in Southwest Florida trends and data to make the best decisions. E-Mail us if you’d like to be included in our Seller’s Club. 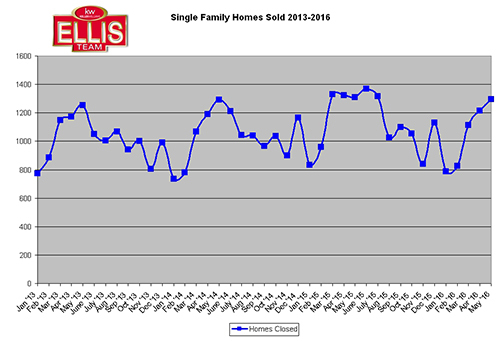 Back in April we reported sales seemed to be picking up just a bit after a lackluster season. We’re happy to report some encouraging news with SW Florida real estate sales picking up slightly. The trend we saw in April bears out in the statistics. Month’s supply of inventory in all but one price range declined which means there are more sales relative to the amount of inventory on the market. 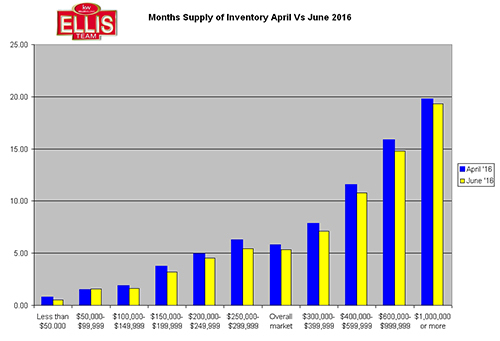 We’ve supplied a chart comparing month’s supply of inventory for single family homes in Lee County Florida in June compared to April 2016. While there is still a large amount of inventory priced $400,000 and up, numbers are looking better. We reported that sales were down about 20% earlier this year; however closed sales in May were just about even with last year’s numbers. While February and March sales were down from last year, May is showing some progress this year. Brexit is in the news and the jury is still out on its effects on our national and local markets. One boon could be lower rates as we see a global flight to quality to US treasuries. When this happens it drives down mortgage rates which are largely based off the 10 yr note. Lower rates would add buying power to local buyers and create newly qualified buyers into the market. The downside could be a lack of consumer confidence and exports which could cost jobs, so we’ll have to wait and see how this all plays out. Every circumstance presents a new opportunity, so we’ll be looking for creative ways to market to the opportunities as they present. 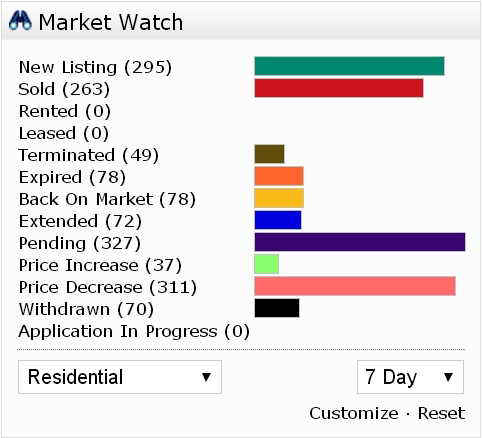 New listings are up 10.6% in May, so hopefully the pending sales keep coming and keep that supply of inventory down. Pending inventory fell 12% in May over last year while inventory increased 14.1% in May over last year, so we’ll have to keep our eye on that. There are so many statistics we research each month that give us a guide to where the market may be headed. It’s worked well in the past and sellers appreciate reviewing all the data when they’re making selling decisions on their home. This is one of the reasons we’ve decided to start up a Seller’s Club. The Ellis Team Seller’s Club is a group of people who have their home on the market or are considering selling their property and are thirsty for market data. We produce a video going over many charts and analyzing the data. We only have so much room in each of these articles so with the videos we’re able to present much more. All of the data is geared to sellers and what they need to know. If you’re listed with another broker this is not a solicitation to obtain your listing. If you’re considering putting your home on the market then you definitely want to tune in. Just email me at Brett@topagent.com and ask to be placed in our Seller’s Club and we’ll add you. It’s that simple, and you’ll look at the same data we look at and receive expert analysis of what it all means and how it affects you. If you’d like to search the MLS like a pro, head on over to www.LeeCountyOnline.com Our database is updated every 5 minutes, so you’ll find hot new properties before other buyers do. If you’d like to list your home now, give us a call. 239-489-4042 We’re easy to talk to and we’re here to help. 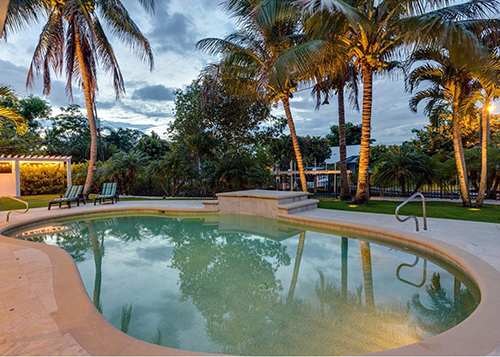 What Does $ 1 Million Buy in SW Florida Real Estate Market? Now it really gets fun. We’ve been doing a series of articles on what you can buy at various price points, and today we answer the question, what does $ 1 Million buy in SW Florida real estate market? We concentrated our search on single family homes but there are some nice condos available in SW Florida in all these prices ranges. None of the listings presented here today are our listings. In fact, in all four articles so far, none have been. We’ve been trying to educate readers on what you can buy, so we’ve hand selected some interesting properties. 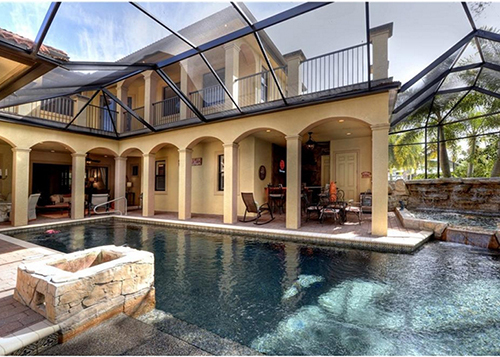 In Fort Myers we found a home listed for just under $1 Million. It is a large 2 story home with over 4,400 square feet of living area. It is located between McGregor and the River and this pool just really caught our eye. There are so many great homes located in this area it was hard to choose. This is a fairly newer home built in 2007 so it was unique. We found a home in St James City listed for just under $1 Million as well. It has 3 bedrooms, 2 ½ baths and has gulf access with a boat dock right out your back door. You can be fishing some of the world’s best fishing spots in minutes. This home is bay front and has 2 boat lifts. Next we head over to Sanibel Island, home to some of the world’s best shelling. This home is a 4 bedroom, 2 bath home and has excellent rental income. 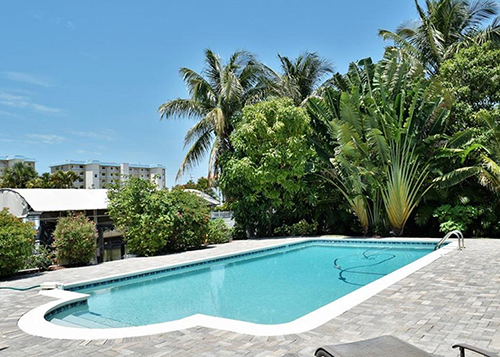 You can enjoy this home for yourself on gorgeous Sanibel Island or you can rent it out and receive close to $70,000 income until you’re ready to call it home. Or you could do both, renting it out and vacationing here. It is nicely decorated and is furnished. 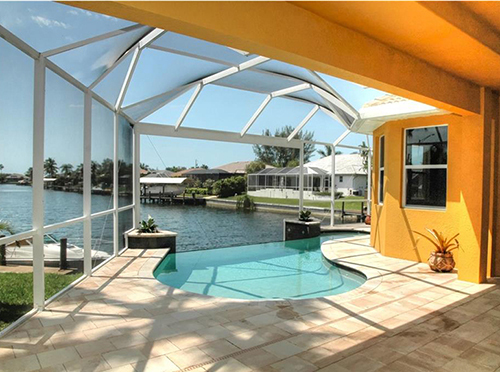 Lastly we found a home in Cape Coral priced just over $1 Million by a few thousand dollars. Imagine heading out on your boat in this gulf access waterfront home and when you come back after a great day of fishing or boating you can jump right into your gorgeous pool. That’s living the good life and what SW Florida is all about. This home features 4 bedrooms plus a den and 3 full baths. It is over 3,000 square feet of living area. If you’d like to rent this home you can for $8,000- $10,000 per month. They say SW Florida sells itself, and it does. 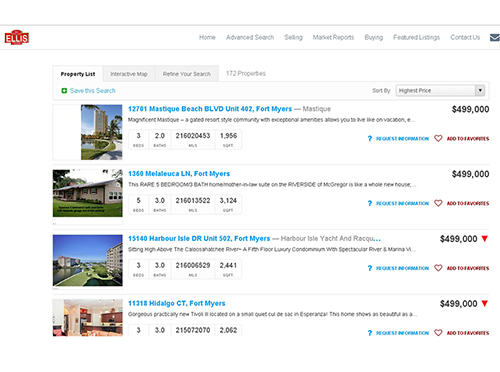 Once people vacation or visit SW Florida they’re hooked, but where do you go to find more information and snoop around all the homes for sale? Simply go to www.LeeCountyOnline.com and you can search like a Realtor. The database includes all homes for sale in the MLS and is updated every 5 minutes, so you’ll know about price changes or new listings hitting the market before other buyers. The key to scoring a great deal is to work with an agent who is knowledgeable about the market and having access to the data. We provide both for you. If you have a property to sell, we can help with that too. Many buyers must sell a property before they can purchase another. If your property is located in another city, we can find you the best agent in that city. You can always call us at 239-489-4042 if you’d like to speak with an experienced agent, or search away on our website until you find something that interests you. Our team is here to help you wherever you are in the process, and on your terms. Give us a call, you’ll be glad you did. The Ellis Team at Keller Williams Fort Myers & The Islands is hiring agents– Read more and see if you have what it takes. Posted in Cape Coral, Cape Coral Real Estate, Fort Myers, Fort Myers Beach, Fort Myers Real Estate, Gated Community, Southwest Florida Real Estate. What Does $ 750,000 Buy in Lee County Real Estate Market? If you’ve been reading our articles lately you’ll notice we’re doing a series on what you can buy in the SW Florida real estate market at various price points. In recent weeks we’ve done the $250,000 and $500,000 range and showed you some excellent choices in those ranges. Today we answer the question, what does $ 750,000 buy in Lee County real estate market? If money is no object, it gets a lot more fun to shop as we go higher in price. These are by no means the entirety of the market, but rather a sampling of a few things you could buy around town in this price range. At Fort Myers Beach we found a nice waterfront home on a wide canal built in 1981. It is 3 bedrooms, 2 baths. 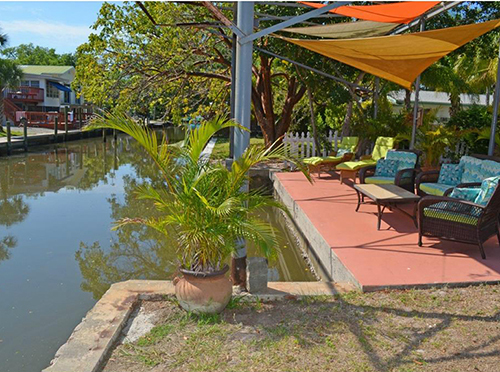 It has a gorgeous pavered pool area and boat lift for your boat at the canal. 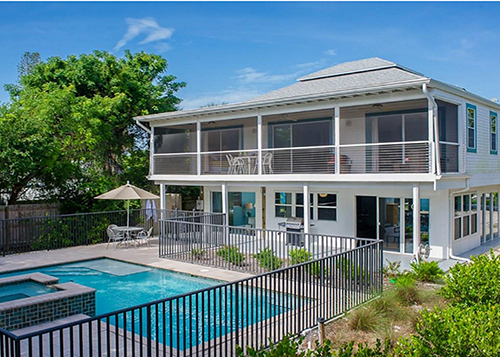 It’s located mid island at Fort Myers Beach and is listed for $725,000. In Fort Myers we found another gulf access waterfront home. This home has 4 bedrooms, 3 1/2 baths with 2,549 sq ft living area. I like the stainless steel appliances, granite counter tops, wood like floors, and of course its location. Keep in mind, none of these listings are ours and we’re reporting based upon pictures in the MLS. 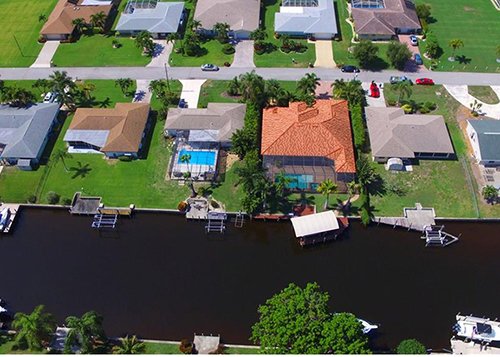 In Cape Coral we found a home just under $750,000 with almost 2,600 sq ft of living area. 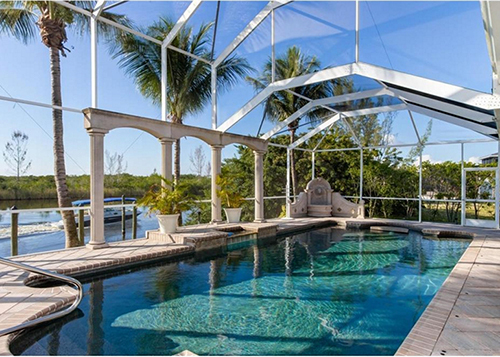 This too is a gulf access waterfront pool home with no bridges. It’s a 2 minute boat ride to the river. It has 4 bedrooms, 3 baths, high tray ceilings and stainless steel appliances with granite counter tops in the kitchen. It has a boat lift and a wet bar with refrigerator area off the pool for entertaining when you get off the boat. 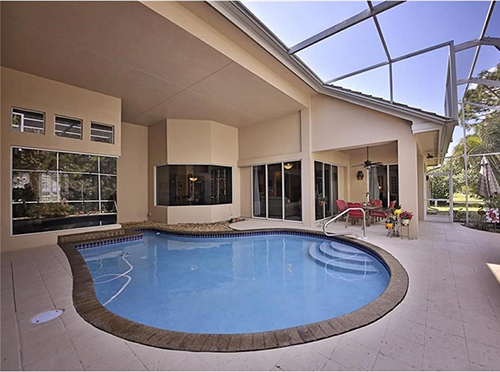 Lastly, we have a gorgeous home on the golf course for you in Bonita Springs priced below $750,000. It is located in Palmira Golf and Country Club and features 3 bedrooms, 3 ½ baths with granite counter tops and custom cabinets on a quiet cul-de-sac street. The community offers a resort style pool and a community center, fitness center and bar and grill. 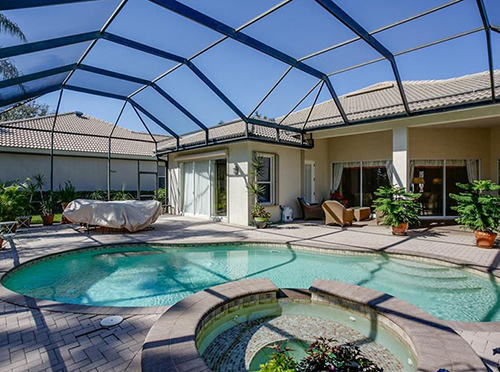 The bottom line is SW Florida has so much to offer for all kinds of different lifestyles. Whether you’re a casual boater, avid fisherman, tennis player, golfer, workout buff, or just like to chill out on your lanai and watch nature, SW Florida has it all. We have single family homes, condos, villas, town homes, and coach homes for easy living. This is one reason our agents spend time asking buyers questions. We don’t really sell anything, because SW Florida sells itself. Rather, we listen to what buyers like to do, what makes them happy, and how they will use their home. Once we determine that, we can identify suitable properties and make some recommendations based upon the buyer’s lifestyle. Each home and each community offers something different. It can be a daunting task when you’re not from here. Buyers don’t want to make a mistake. This is why hiring a seasoned agent accustomed to working with buyers can make all the difference. I can’t tell you how many times buyers have thanked us for listening to them and suggesting certain properties based upon their needs. We help with new construction as well. It doesn’t cost any more to use a Realtor, and many times it will save you money because we know the incentives being offered. Builders also like Realtors because we can be a source for repeat business. A good Realtor can point out the pros and cons based upon your needs, not the seller’s or the builder’s. The Ellis Team is looking for talent. If you’re a licensed agent in Florida and willing to learn and work, we may have the opportunity for you. Please contact us. Our team is growing and we need good people to help our clients.